Alicia Gimenez-Bartlett's lively style and rigorously exact descriptions of police procedure have won her numerous awards and made her Spain's best-loved mystery writer. In this best-loved volume of the Petra Delicado series, hard-nosed Inspector Petra Delicado and her sentimental sidekick, Fermin Garzón, begin an investigation into big-money dog smuggling with only a few, strange elements: a mongrel dog named Freaky, the corpse of a man with a seemingly endless list of aliases, and a handful of tips from an anonymous woman caller. Their best leads come from the least likely sources: a ruggedly handsome vet; a blonde bombshell who trains guard dogs; an eccentric university professor; and a haughty dog groomer. At times, these two world-wise detectives are at a loss, but Delicado and Garzón are not the sort of cops that rely on hunches. They methodically pursue their investigation, drawing the reader into a complex and sordid story. 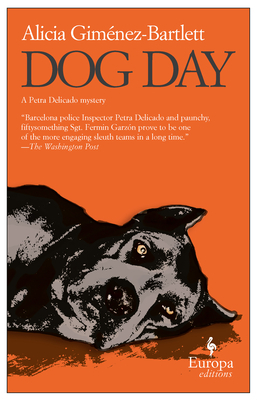 Dog Day is set in a Barcelona that few visitors to the city will ever see, a Barcelona that lurks beneath the surface of one of Europe's most dazzling cities. A broken heart, a new monstrosity, and another dead body accompany every step through this demimonde. Though passions and profits may turn men into beasts and animals into victims, Delicado and Garzón will stop at nothing to get to the root of these twisted and perplexing crimes. Alicia Giménez Bartlett was born in Almansa, Spain, in 1951 and has lived in Barcelona since 1975. Her Petra Delicado series quickly turned her into one of Spain's most popular and best-loved crime writers. In 1997, she was awarded the Femenino Lumen prize for the best female writer in Spain, and in 2006 she received the Baccante literary award.